Now your video production kit can be complete with this great new addition from DJI. The Mavic Air. The Mavic Air ships on January 28 for $799. At that price, it hovers in DJI’s lineup between the $499 DJI Spark, the gesture-controlled flyer released last year, and the more capable $999 Mavic Pro. The Mavic Air is tiny, half the size of a Mavic Pro, and about half the weight at just 15 ounces. When folded up, it’s about the size of a paperback novel. At a press event in New York on Tuesday, DJI exec Michael Perry announced the Mavic Air by pulling it out of the pocket of his puffy Patagonia vest. Want to see some specs? The Air has them in impressive quantity. The drone’s built-in camera shoots 4K video and 12-megapixel stills, and it can take 32-megapixel panoramas of your local park. That camera is mounted on a newly designed, three-axis stabilizing gimbal. Flight time is quoted at 21 minutes—impressive given the little folder’s small size—and it hides antennas in the landing gear, giving the drone a flight range of 2.4 miles. The speed tops out at 42 miles per hour, a smidge faster than the Mavic Pro, and 11 mph faster than the Spark. The Air has all of the automated flight modes you’d expect, including several which only require the pilot to tap a button on the controller. To take advantage of that new camera, there are some new image-capture tricks that let you take spherical panoramas, and a couple of new flavors of epic zoom-in shots for when you want to show off whatever impressive natural setting you’re standing in. It has gesture controls just like the Spark, so you can command it to take off and follow you around by moving your hands. And yes, you can still ask it to take a selfie by forming a “picture frame” with your thumbs and forefingers. The Mavic Air’s obstacle-avoidance tech seems on par with the high end of dronedom, with sensors on the front, back, and sides that keep the Mavic Air from crashing into walls, parked cars, power lines, and the pilot (you). Some new software DJI developed for this drone uses the onboard cameras to scan the area in front of the Mavic Air, then plans a flight path before it even approaches any obstacles. The pilot just pushes the controller’s joystick forward, and the drone zips around the trees, rocks, and people in its way. The Mavic Air lands at a time when DJI is already flying high. The company had a hit last year with the palm-sized spark DJI Spark and foldable Mavic Pro. 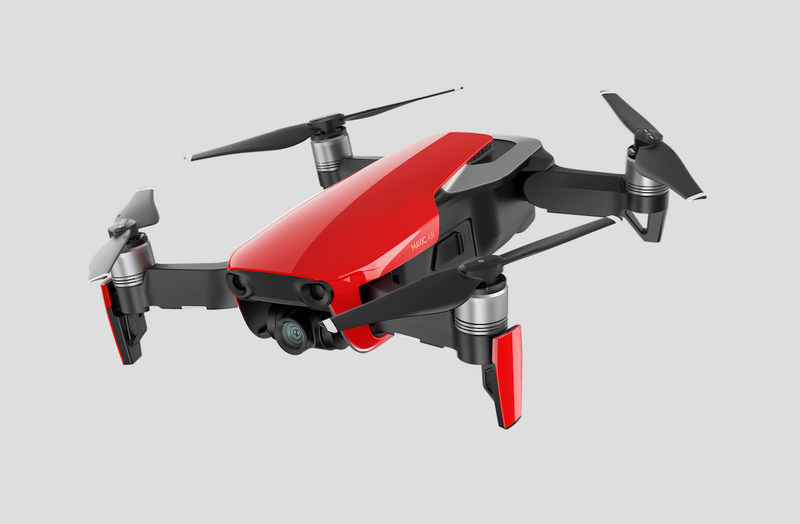 Meanwhile, one of DJI’s main competitors, GoPro, was forced to recall its folding Karma drone last year, eventually scuttling the product, halting manufacturing, and laying off drone-focused employees a couple of weeks ago. The other big name in drones, Yuneec, announced three drones at CES 2018 earlier this month: a fixed wing drone, a pro-level hexacopter, and a nimble racing drone. With GoPro out of the running and no folding drones in Yuneec’s new lineup, DJI is free dominate that sector of the market, where it suddenly seems as though the sky’s the limit.